Bunhill Quaker Garden was formerly the Quaker burial ground and it is estimated 12,000 Quakers were buried here in unmarked graves including George Fox, the founder of the movement. The site was the first freehold land the Quakers acquired in 1661 and there is still a meeting house here. The word 'Bunhill' evolved from ‘bonehill’ as the area had been used as a burial ground as far back as Saxon times. Between Chequer Street and Banner Street, EC1. 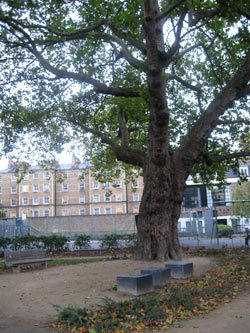 Walk through Bunhill Fields burial ground from City Road and out the other side. Cross over and slightly to your right is Chequer Street. Turn right at the end of the basketball court and there it is. Why has it tickled our fancy? We espied it on a map while out walking through Bunhill Fields the other day in the dusk and drizzle. It’s tucked away between a playground and blocks of flats but is a calm and peaceful place to sit, simply and subtly laid out with benches for lunch eating and single block seats for the contemplative soul. it's hemmed in by an imposing block of flats and kids' playground but on the day we visited, was remarkably quiet. The garden is dominated by a great big old plane tree with minimalist borders round about. A blog written around the time this garden opened shows a flourishing wild flower garden in summer months so we’ll definitely be keeping an eye on this place, year round.